Thomas Midnight Pewitt graduated from Linns Valley – Poso Flat School where he developed a love for poetry. He loved performing at Cowboy Poetry Night and all sports. Midnight loved High School! He was active in the Future Farmers of America (FFA) and played on the Junior Varsity Football Team at North High. Midnight’s favorite “subject” was making new friends. He had a personal goal to make new friends and always said “everybody is my friend.” Working on the family ranch was part of Midnight’s everyday life. He did it all: working with the livestock; operating the backhoe, bulldozer, trucks, quads; building coral, fence, or an engine. The Pewitt family would like to honor Midnight by helping hard working students of Agriculture and Athletes who wish to improve themselves through higher education. 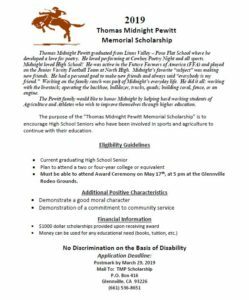 The purpose of the “Thomas Midnight Pewitt Memorial Scholarship” is to encourage High School Seniors who have been involved in sports and agriculture to continue with their education. Must be able to attend Award Ceremony on May 18th, 2018, at 5 pm at the Glennville Rodeo Grounds.